Proin nec mi condimentum sapien feugiat sagittis nec vel nulla. In semper justo quis lorem vulputate, non pharetra elit hendrerit. Vivamus sagittis nulla sed tellus malesuada, in venenatis ligula mollis. Nullam et sem a erat posuere bibendum vel vitae lacus. Everest Base Camp, Gokyo Lakes, and the Three Passes are two most sought after destinations in the Everest region. Here is an opportunity to cover all these destinations in one package in our especially designed Everest Three Passes Trek-21 Days. 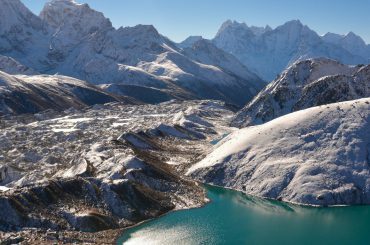 Be sure to be mesmerized by the turquoise waters of Gokyo lakes, glaciers suspended on the Himalayas. Other important destinations that we visit are the Renjo, Chola and Kongma La passes. Also trek to world’s most sought after trekking destinations – the Everest Base Camp. Another great attraction is the Kalapatthar – a mountain of black rock. The Kalapatthar Top is one of the most sought after vantage point to see Mt. Everest. Experience the unforgettable moments by witnessing an extraordinary natural and cultural landscape. Enjoy the 360 degree panoramic views of above 8000m massifs and other mountain ranges. We invite you to experience our amazing Everest Three Passes Trek-21 Days package which focuses on adventure, fun, cultural exposure, and not the least, proper acclimatization. The real trekking begins from and ends in Lukla – the gateway to the Everest Region. 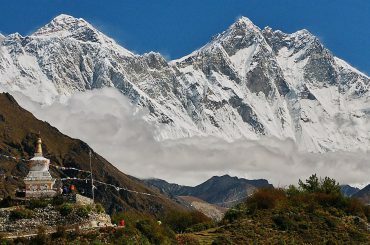 Other important trekking destinations that we visit are Gorakshep, Tengboche, and the Sherpa capital of Namche Bazzar. Please note that often the Kathmandu-Lukla-Kathmandu flight gets delayed by a few hours or may even be canceled for one, two, or more days due to unfavorable weather conditions. Such conditions may arise even in the best seasons. 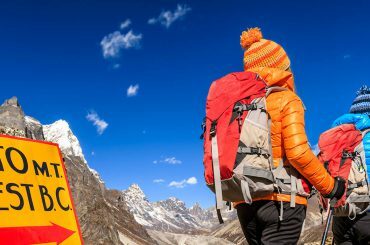 Hence, in such cases, you must be prepared for long waits both at Kathmandu or Lukla airports, as this can happen either at the start or end of the trek or even both! We do our utmost to avoid such delays, and fix you on next flight. Still, we suggest you to be prepared for possible delays/cancellation, and if possible to come with some extra buffer days (1-2 days) at the end of the trip to accommodate such delays. We also organize heli rescue in such conditions, if it’s available and upon request by our clients. The helicopter charges around USD 350 per person and it allows 4-5 persons in a flight. In case, the flight delay/cancellation happens at the start of trip and it goes so long that it disturbs your onward travel schedule, you are free to choose an alternative trip: such a trek in the Annapurna, Langtang, or any other regions. If you are not interested in the alternative trip and would rather wait for the trip, you are welcome to wait in Kathmandu for as many days as it takes to get a flight to Lukla. However,there will be no refund, if you lose your time waiting at the airport and do not take an alternative tour or you only do short trek later due to time limitation. If the cancellation happens before the trip, we will provide you accommodation and lunch in a guesthouse in Kathmandu. In case of the flight delay/cancelation after finishing of the trek, you will be responsible for all your expenses but your travel insurance may cover those expenses depending upon the insurance company you have and also note that you will not be entitled to any refund for the services (such as hotel, transport, flight, etc) included in the package that you would not use later. After breakfast, we come out of Namche Bazar east past the monastery and begin with a short uphill trek. On the left we have the Kongde Ri (6187 m) and the river that flows down into a ravine. On the right is the rocky Khumbi Yul La (5765 m) and behind us is clearly visible on Kusum Kanguru (6,373 m). After an hour walking mostly downhill into the forest, the trip continues. At this juncture, the steep rise up about 50m in altitude to reach a ridge around it. The river bed becomes closer and wider. We reach the village of Phurte and then the small town of Samde along the stretch halfway up a slight slope leading to the bridge over the Bhote Koshi (3650 m). Cross it and about a half hour climb brings us to Thame. If the sky is clear, we will see the beautiful peaks that gaurd the village to the west. We take our breakfast and head for the next camp towards Marlung. The terrain from Thame to Marlung is alpine zone and there is very less vegetation. We enjoy the peace and relative solitude of this little trekked valley. We next bend around the village of Tangmote. After about an hour, we walk parallel to the village of Yellajung on the other side of the Bhote Koshi. We pass by the Tarngga village enjoying superb views of Kongde Ri as we look down the trail. A further 45 minutes or so on a gradually rising trail brings us to Marlung. It is a short walk today from Marlung to Lungden. After Marlung, we walk for about an hour and then climb a small rasing hill. Upon crossing the water stream we trek 2 to 3 hours to reach Lungdeng. As we hike further to the top of Renjo La, we get the outstanding views of the surrounding. The Everest itself, Lhotse, Cholatse and Taboche can be seen shining in the sun. Views from Renjo La are much like that from Gokyo Ri with third Gokyo Lake and Gokyo Village beneath the gray smear of Ngozumpa Glacier. We walk further to Gokyo through the glacier. An easy walking down brings us to Gokyo. Early morning, we hike up to the Gokyo Ri (Gokyo Peak). Climbing to Gokyo Ri is obviously strenuous as it is steep up and takes about 3 to 4 hours to reach the top. But even from the trial scenery of Gokyo village on the edge of third lake overlooked by Cholatse and the broad Nogzumpa Glacier are mind blowing. We feel like we are surrounded by panoramic mountains like Kusum Kanguru, Thamserku, Kangtega, Taboche, Cholatse, Makalu, Lhotse, Nuptse, Everest, Changtse, and Pumori. Sight of sunrays kissing the Everest that towers over all surrounding peaks is unlike from Kala Patthar (from Kala Patthar Nuptse seems taller). Our Gokyo Ri visit will be unforgettable life time memories. We trek down to Gokyo. Upon breakfast we trek to Thaknak for overnight scaling by the second Lakes and the Ngozumba Glacier. Overnight at Thaknak. Cho La Pass is also another show up of this trip. Today is the toughest day and we need to start early (4-6 am) compared to other days on the trip. The pass is not itself difficult but it is steep and involves a glacier traverse on the eastern side. We need to be careful as the trail is vertical and the rocks glazed by ice add trouble to the trekkers making the trail slippery. Thought the trail from Phedi climbs through a ravine and a rocky trail we climb up continuously. While trekking through the side of a frozen lake we reach at the top of the pass decorated with prayer flags. The pyramidal Ama Dablam presides over a range of mountains on the south even as Cholatse soar on the west and Lobuche East and Baruntse rises sharply to our right. We need to pass through some crevasses before we reach Dzongla, another beautiful place with a complete view of Mt. Cholatse, Mt. Ama Dablam, Lobuche peak and the Pheriche village far below. Overnight at a very basic local lodge. Today’s walk will be a bit shorter. Thus, we would get more time to observe and relax. We climb down from Dzongla and cross a bridge and then transverse through grassy trail. Enjoying the view of Lobuche Peak we stretch up eventually through a ridge. Ama Dablam, Kangtega, Thamserku Taboche are seen looming prominently. Curving round through the wide gravelly river bed, we will be at Lobuche. Overnight at Lobuche. The trail to Gorak Shep goes ahead through the lateral moraine of the Khumbu Glacier. We pass through the pyramid sign post. Ahead on the trail we see crest of north ridge of Everest along with Mt. Pumori, Mt. Mahalangur, Mt. Lingtern, Mt. Khumbutse, Mt. Nuptse, etc. A small ascent would take us to Thangma Riju from where we perceive 360 degree vista of snowy mountains. Climbing steeply up to the top through the torrent of Changri Glacier, we catch our first glimpse of Kala Patthar, a grey-green knoll beneath the Mt. Pumori. As we reach Gorak Shep, we will find snow-capped mountains looming all around us including the top of the world – Mt. Everest. After a brief lunch and rest, we take the trail to Everest Base Camp through the once vast Gorak Shep Lake. Continuing straight ahead, we come through the Indian army mountaineers’ memorials. Only upon reaching the Everest Base Camp do we really appreciate the Everest climbers who brave the hazardous route through the Khumbu icefall. Mountaineer’s tents stand out in bright colors against the monotony of gray surroundings (especially in the Spring). Nuptse, Khumbuste and Pumori are the mountains we can view from the base camp. Everest actually is not visible from here. By now we have met the ultimate objective of our trip. Overnight at Gorak Shep. Today is the climax of our trip. We start early in the morning to catch the dramatic views from Kala Patthar witnessing the first light of day shining on Mount Everest. However, we need to get prepared for an early morning, dark and cold temperature (-10 to -14 C) departure beforehand. Further, there is always the potential for chilly wind which is quite common. Familiar peaks such as Lingtren, Khumbutse, Changtse tower to the east even as Everest begins to reveal itself emerging between the west shoulder crest and Nuptse. During the ascent to Kala Patthar, we can pause to catch our breath at several outstanding view points to snap pictures. After several hours of an ascent, we reach Kala Patthar. From this juncture, we scramble to climb the rocky outcrop near to the summit marked by cairns and prayer flags. As we reach the top, we sit on the Kala Patthar where rocks our eyes taking unbelievable Himalayan Panorama, wandering from one mighty massif to another. We take as many pictures as we can and take the in view with our mind’s eye to last lifetime. On being back to Gorak Shep, we have breakfast and then slowly descend down to Dingboche via lobuche. From Lobuche, we pass through Khumbu Glacier. Climbing up we reach Kongma La. There is a Pyramid shaped Italian Research Centre at just over 5,000m. We enjoy the views of the wide basin dotted with frozen lakes. 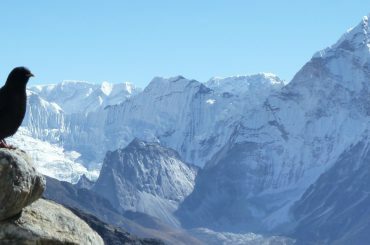 Again we enjoy the marvellous views of Cholatse, Pokalde, Nuptse, Lhotse, Makalu and Ama Dablam. Then we turn and walk through the stony trail. While descending down the Niyang Khola valley, we enjoy the great views of Amphu Lapcha Pass and Island Peak. Trekking further we get to Chukkung. The trail descends steeply downward so we need to walk slowly and under control as our shaky legs continuously battle the rocky terrain. After crossing the suspension bridges over the fast flowing Dudh Koshi and its tributaries the trail becomes more level and natural. By today we start to get warmed up by the light breeze. Any remaining sore throats and colds will be gone by today as we pass through this charming mountain air. Although we are travelling the same route down, we feel completely different views. We snap a mixture of open plains, rhododendron and pine forests, and in the distance snow covered peaks. We walk through the Sherpa villages’ noticing impressive faith in Buddhism and culture of prayer stones and prayers flag while we walk through the villages. Upon arrival in Lukla, we stretch those sore legs and recall the experiences of the last couple of weeks. We experience the culmination of a fantastic trek on a happy note with everyone back safe and sound with smile on faces! Overnight at Lukla. You can bring your personal clothing if you already have them with you,if not it’s worth buying all below mentioned clothing and equipments here in Kathmandu in good rates and your guide will help you with it.You will have plenty of time before the trek to buy stuffs in Kathmandu(thamel).